When you look into your dog’s eyes, if they are a little cloudy or hazy, it could indicate that cataracts are forming. Eyes have lenses inside them to help us focus and see objects clearly. A cataract is any opacity within the lens. Very small cataracts do not affect vision much, however as they develop, cataracts can cause vision impairment and blindness in dogs. Incipient cataract – consists of focal or multifocal small opacities (not more than 10-15% of the lens) and does not affect vision. Immature cataract – involves more than 10-15% of the lens. Visual deficits are usually mild or undetectable. Mature cataract – involves the entire lens, completely obscuring tapetal reflex. Vision loss is more evident; some owners might note presbyopic signs, such as difficulty in climbing stairs or seeing objects up close. Hypermature cataract – characterised by a sparkling appearance and lens capsule wrinkling. It can take several months to years for a mature cataract to develop into a hypermature cataract. Do not be confused! Loss of transparency to the lens can also be caused by nuclear sclerosis, which is an age-related hardening of lens. 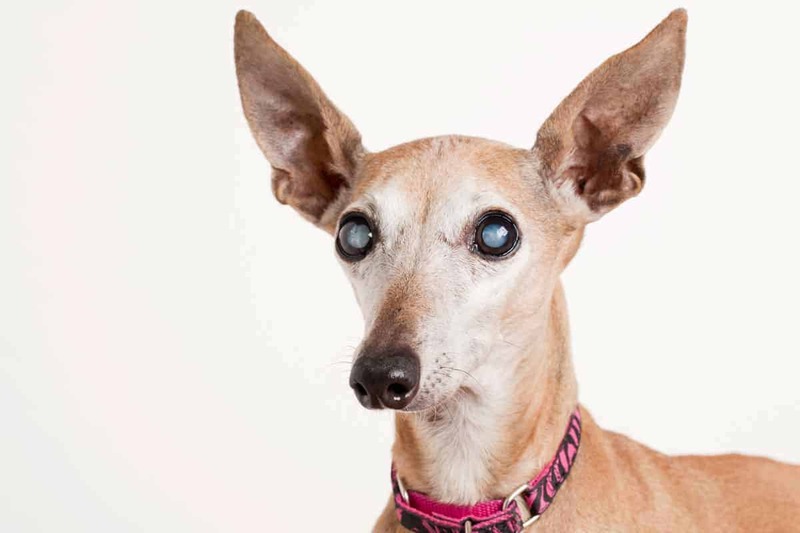 This condition causes the lens to develop a grayish-blue tinge, which increases in density as the dog ages. Nuclear sclerosis can occur in people too, causing reduced near-vision as their lenses are not able to change shape as easily. Dogs, however, do not have good near-vision, thus nuclear sclerosis does not significantly affect their vision. Bear in mind that senior dogs can develop both nuclear sclerosis and cataracts. 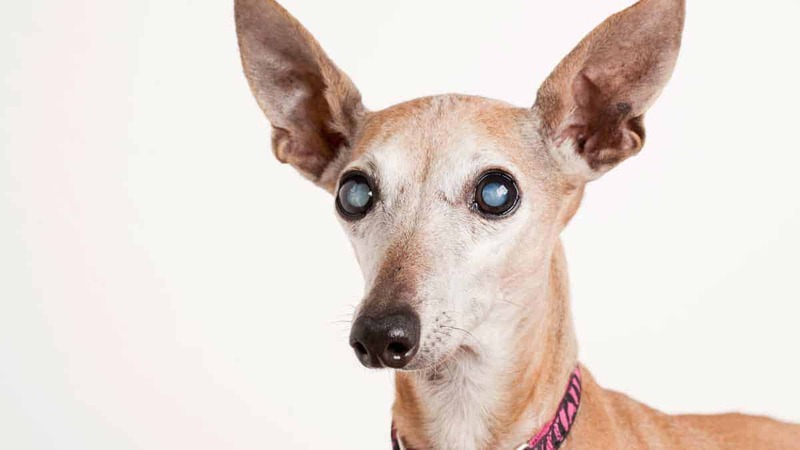 Thus, be sure to bring your dog for a checkup as cataracts require long-term monitoring and treatment. Cataracts can be inherited or caused by eye diseases, lens trauma, or diabetes mellitus. Inherited cataracts can occur at any age, and is common in certain breeds such as Bichon Frises, Boston Terriers, Poodles and Cocker Spaniels. When there is trauma to the eye, the lens capsule can rupture, causing leakage of lens contents into the eye. This results in cataract formation and uveitis (inflammation in the eye). Some commonly seen signs of uveitis include eye redness, squinting, tearing and photophobia. Diabetic cataracts, on the other hand, are usually bilateral and tend to develop very fast. Their formation is caused by increased sorbitol levels, which draws water into the lens, damaging the lens fibres and causing them to become opaque. As cataracts develop, they can cause uveitis, retinal damage and glaucoma, eventually leading to blindness. The mainstay of treatment is phacoemulsification (surgical extraction of lens) with placement of an artificial lens. It offers the best prognosis and dogs can see close to normal after successful surgery. This is the only effective way to treat cataracts, however surgical success is not guaranteed. Complications of phacoemulsification include endophthalmitis, corneal disease (e.g. deep corneal ulcers, dry eyes), retinal detachment or glaucoma. Cataracts cannot recur after surgery, however some dogs may have reduced vision years later due to formation of scar tissue postoperatively. Do not move furniture unnecessarily or leave obstacles (e.g. children’s toys) around. Ensure that there are no sharp objects, potted plants at your dog’s eye level. Teach family members and friends to approach your dog slowly and cautiously. Always call out their names when approaching so as not to startle them with sudden movements. Training is important as they respond solely to auditory cues. Clode, A 2016, ‘Differentiating nuclear sclerosis from cataracts’, <http://www.cliniciansbrief.com//article/differentiating-nuclear-sclerosis-cataracts>, viewed on 13 May 2016. Herring, IP 2004, ‘Cataract’, Veterinary Information Network (VIN) – For Veterinarians, By Veterinarians. Lim, C et. al 2011, ‘Cataracts in 44 dogs (77 eyes): A comparison of outcomes for no treatment, topical medical management, or phacoemulsification with intraocular lens implantation’, The Canadian Veterinary Journal, vol. 52, no. 3, pp. 283-288. McCalla, TL 2001-2016, ‘Cataracts and cataract surgery in dogs’, <http://animaleyecare.net/diseases/cataract/>, viewed on 13 May 2016. Reinstein, SL 2016, ‘The hazy lens: cataracts and nuclear sclerosis in dogs’, Clinician’s Brief, Feb 2016. Nestlé Purina PetCare (UK) Ltd <https://www.purina.co.uk/dogs/health-and-nutrition/dogs-with-special-needs/coping-with-blindness>, viewed on 17 May 2016.